Revolution brews in the empire of Minkai as the people take up arms to throw off the yoke of their unnatural oni masters. With the populace rising, the heroes lay siege to the capital of the empire, the ancient city of Kasai. There, they must discover the secrets of emperors past and seek the aid of ageless beings, gathering all the allies they can for a final assault on the bastion of the murderous Jade Regent. Will the heroes and their companions be able to bring an end to the warlord's tyranny? Or will Minkai remain locked in the grip of true evil? Confront the powers of destiny and shape the fate of a nation in this, the exciting final chapter of the Jade Regent Adventure Path. 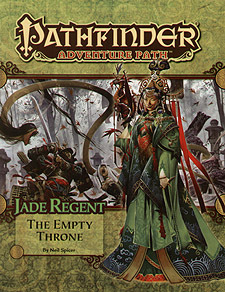 "The Empty Throne," a Pathfinder RPG adventure for 13th-level characters, by Neil Spicer. A gazetteer of the city of Kasai, capital of the mysterious nation of Minkai, by Frank Carr and Michael Tumey. Plots and high-level threats to continue your Jade Regent campaign, by Patrick Renie. Deceit and revelation in the Pathfinder's Journal, by Dave Gross. Four new monsters, by Jesse Benner, Tork Shaw, and Owen KC Stephens.